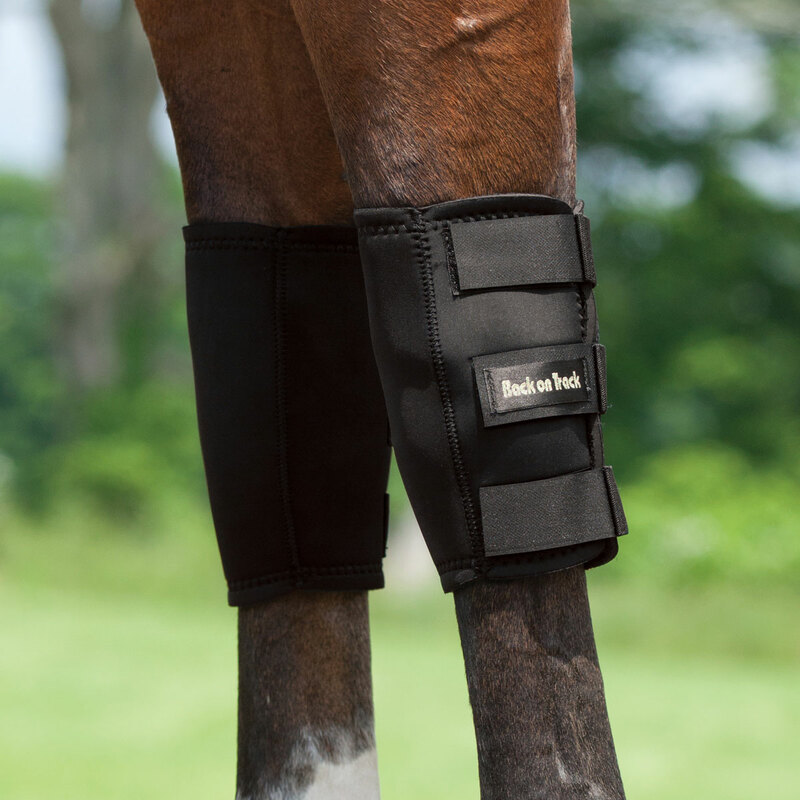 Relieve and Heal Injured Muscles, Joints, and Tendons with Back on Track's Contoured Horse Knee Boots. Back on Track Therapeutic Knee Boots are ideal for injury recovery or prevention in the tough to wrap knee area. Consisting of a neoprene exterior, Back on Track infused the interior of the boot with their state-of-the-art Welltex fabric, which contains ceramic powder. Heat therapy is a well-recognized method used to help relieve and heal injured muscles, joints, and tendons. When you use these boots it helps to use standing wraps to prevent them from sliding down. Pair. 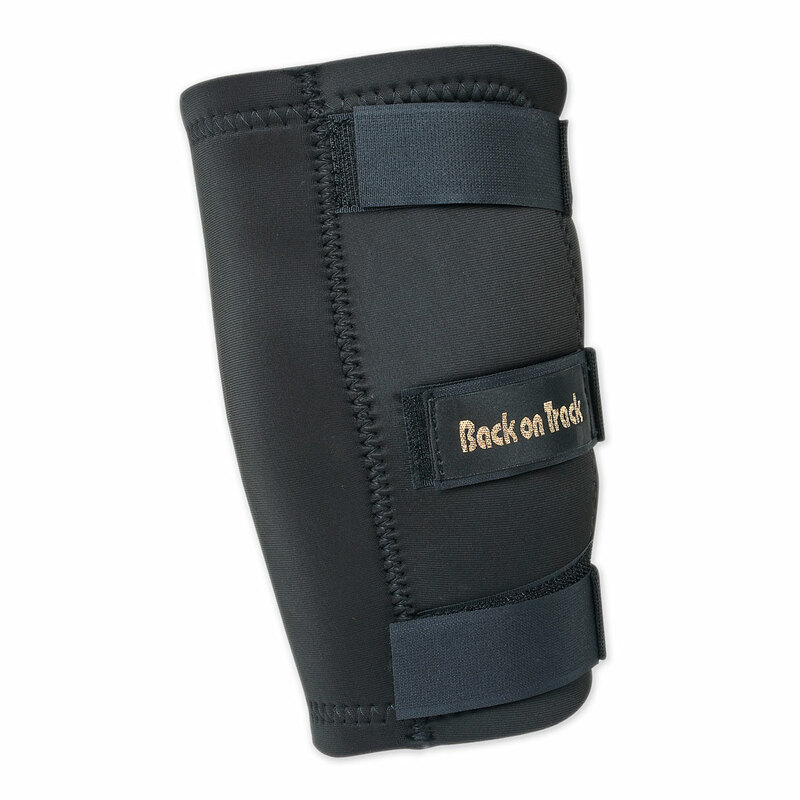 Back on Track recommends using a standing wrap to support the Knee Boots. The Eskadron Protection Boots are the original jumping boot by Eskadron! Made of TPE with a VELCRO® fastening. Neoprene lined. Special recess in the upper area for better wearing comfort. Value Pack includes both front and hind boots. Back on Track Therapeutic Knee Boots is rated 4.4 out of 5 by 28. Rated 5 out of 5 by SallyR from A must-have for the arthritic horse This is the 2nd horse we've treated with Back on Track knee boots; they are wonderful, adding comfort and support that allow her to be comfortably ridden (within reason; short sessions, lightweight rider) despite arthritis. Rated 5 out of 5 by Kaitlyn913 from Awesome boots I bought these about two weeks ago and I love them! They are amazing! My horse has sever arthritis and these seem to be working wonderfully! The only issue I have with them is that they will fall down sometimes. Rated 5 out of 5 by cscwinsty from LOVE LOVE LOVE I can't say enough good things about these!! I got larges for my 17.1hh German Hanoverian They stay up so well!!! Rated 2 out of 5 by Krystal from Disappointed Got a pretty good sized warmblood mare so figured mediums would fit well. She's got a weird knee that's she's pretty sound on, it just gets swollen and stiff occasionally. I put these on and 20 minutes later, they're down around her ankles. Tried flipping them upside down and that worked for a day then not anymore. The only reason I'm giving them 2 stars is because when I could get them to stay up, the swelling really did go down and her knee looked good. Rated 5 out of 5 by Molly from I bought these a month ago and am slowly seeing results. My gelding had a very weird knee injury in his soft tissue that swells up often. With consistent work, cold therapy, and these wraps it is starting to look much better. I have to say I was skeptical at first but I'm falling in love with BOT! I've had no issues with them staying up. Rated 5 out of 5 by Robin from Stays up! I've been wrapping my mares leg for about six months morning and night because the "knee wrap" kept sliding down. Back on Track has stayed up! Rated 5 out of 5 by Darla from Great results So far very happy with the knee boots. Easy to put on and my horse seems to like them. Weather has been terrible so not been able to ride but she seems more comfortable. Rated 5 out of 5 by Emma from Love these! These definitely provide heat to his knees, and quickly. Stay on perfectly without standing bandage, I think you just need to find the right size. I went off of SmartPak's size chart, but there is a more in depth one at the Back on Track site. I use them when he is standing on cross ties or in his stall but I have also walked him around a bit in the indoor and had no slipping issues.